Launchpad couldn't import bug #12839 from freedesktop.org Bugzilla. When displaying a PDF document with a non-embedded font 'ArialMT', no attempt is made to display the ArialMT font. evince asking fontconfig to produce the closest match to the ArialMT font. no request for font is seen in debug output of fontconfig. It might be a poppler issue, poppler seems to convert ArialMT into Helvetica wich receives a less fitting match from fontconfig when Arial is present. The 'normal' text on for instance book page 7, is in acrobat reader a serif typeface, in evince it is a 'sans-serif'. pattern any family Equal "Palatino-Roman"
It starts finding a proper font match. FcConfigSubstitute test pattern any family Equal "Palatino-Roman"
pattern all family NotEqual "sans-serif"
pattern all family NotEqual "serif"
pattern all family NotEqual "monospace"
Does this help you any further? By the way, i've recompiled libpoppler-glib and removed the internal font face translation (effectively delegating it to fontconfig). And the PDF's look almost perfect. By the way, i've recompiled libpoppler-glib and removed the internal font face translation (effectively delegating it to fontconfig). And the PDF's look almost perfect." i wonder how are we supposed to transform PalatinoLinotype-Roman into Palatino-Roman. why don't you let fontconfig do the job there? I´d reported problem in this bug thread, my main concern, the viewer can show chinese only anormally, also a few western document without correct font displayed. For the Chinese case, please see the attached file. 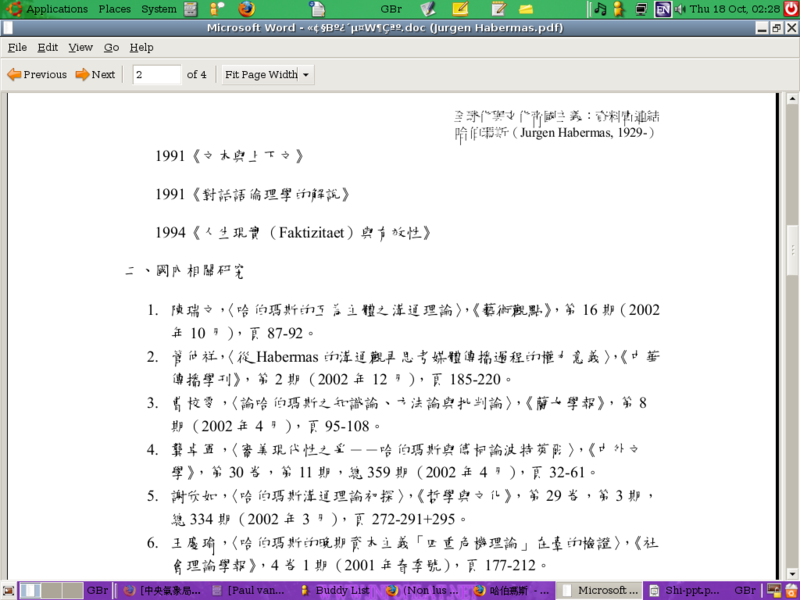 The characters seem very strange and hardly readible and it happens everytime I am to view a portable document in Chinese. Could you reply to the bugzilla comments? is this still valid? and is it really cairo-backend only? I see the same font with current poppler than acroread. with current poppler than acroread. " Here is a example file that has almost nothing displayed, despite hebrew support installed. I have a problem with some minor errors with mathematical glyphs. In my case evince displays a - " - instead of the - ≤ - glyph, it is very confusing. Fontconfig is just a mess. which apparently isn't such a correct symbol replacement. Hopefully, if you have that package installed the same will happen and the <= glyph will render normally again. These files were using the Nimbus Roman No9 L to render most fonts and its very bad Times replacement, becuse it misses Hebrew glyphs. I hoped to install MS fonts from 'ttf-mscorefonts-installer', but If you installed them in hope that you will get correct fonts, font-config won't pick these fonts. The point it that these replacements don't contain nearly as much glyphs as needed unlike MS fonts and fonconfig isn't smart enough to pick _any_ font that has these glyphs. I am not picky about fonts, I just need to be able to read the document, in this case in Hebrew. Instead of MS fonts, you can use the Dejavu fonts at least which are installed, and once again fontconfig doesn't pick them. These fonts have good Unicode coverage, but still don't render everything correctly, in that old homework. Once again to let these fonts to be used you need to apply some magic to /etc/fonts. And note that I used KDE's okular to find out which fonts were actually used as evince of course doesn't report that. I solved the problem by adding ArialMT->Arial alias to /etc/fonts/conf.avail/30-metric-aliases.conf. I attached the patch. Attached the patch which adds ArialMT alias to /etc/fonts/conf.avail/30-metric-aliases.conf, that is fontconfig-config package. I tested it on PDF document without ArialMT subset included and it works fine. Please consider committing the patch to upstream ASAP. The attachment "ArialMT fix" of this bug report has been identified as being a patch. The ubuntu-reviewers team has been subscribed to the bug report so that they can review the patch. In the event that this is in fact not a patch you can resolve this situation by removing the tag 'patch' from the bug report and editing the attachment so that it is not flagged as a patch. Additionally, if you are member of the ubuntu-reviewers team please also unsubscribe the team from this bug report. You can subscribe and participate further through the new bug through this link to our GitLab instance: https://gitlab.freedesktop.org/poppler/poppler/issues/210.